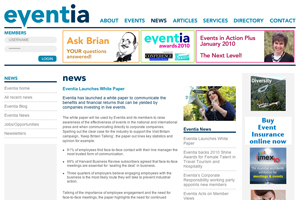 Eventia has published a white paper designed to prove the commercial benefits of live corporate events. The white paper includes statistics that illustrate the financial benefits of events, and is part of Eventia's campaign to raise awareness of the value of events within the communications mix. The white paper says that Sainsbury's and O2 partially attributed their recent growth to highly developed employee engagement models. It quotes Sainsbury's chief executive Justin King as saying: "In our business, with almost 150,000 people, engagement is a key concern. In businesses of our scale you don't even get started without engagement." It also says that Sainsbury's attributed a 3% increase in its bottom line to the impact of its 2008 conference, which was managed by DRP Group.